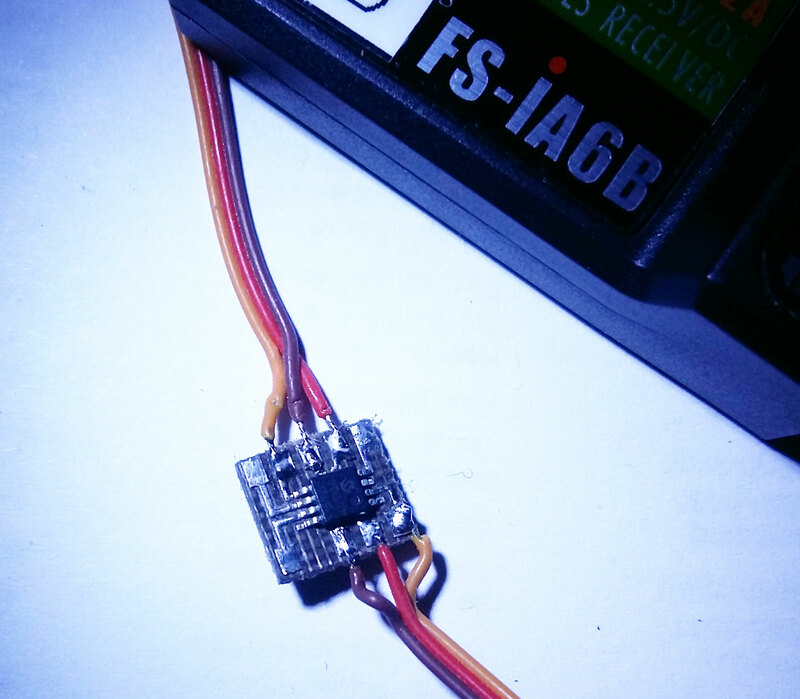 FlySky iBus to PPM Converter based on PIC12F1572 Hardware. Useful if you have patched your i6 transmitter for 8 channels. Input is the iBus stream from an iA6B receiver. May also work with other receivers but I haven'tried it. Outputs an 8 channel PPM stream to go into flight controller. Also outputs PWM channels for channel 7 and 8 to use with the 6 from the receiver if you want 8 channels of PWM. More details will follow when I get around to it, but for the time being for those who are used to PIC development, here is the method. Download to your chip. I use PicKit 3. You can flatten out the pins of the chip and solder wires direct to them or make a mini pcb. Encapsulate with some heat shrink sleaving. With an MSOP chip and a fine soldering iron it can be tiny.